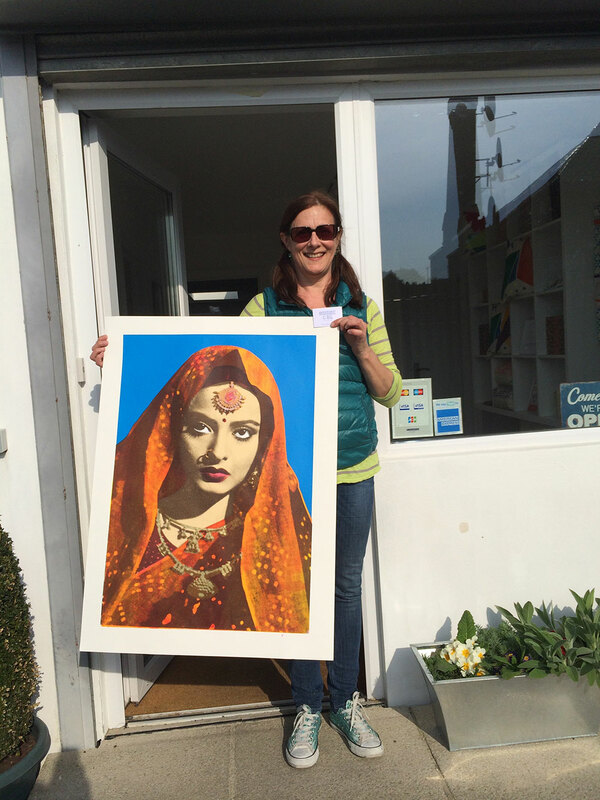 I am showing my Bollywood prints at Chit Chaat Chai, 356 Old York road, Wandsworth, London for three months. Lovely place for Indian street eats. Looking in on my work, looking cosy on a winters day. The Bookmarks projects series aims to encourage appreciation of work in the format of the artist's book. Participating artists each produce an edition of 100 signed and numbered bookmarks to give away through distribution boxes at venues around the world. Over the last twelve years, the Bookmarks series of free artwork distribution has visited 125 galleries, bookstores, workshops, centres, schools and libraries in Australia, Brazil, Canada, Croatia, Cyprus, Denmark, Egypt, France, Germany, Iceland, Ireland, Italy, Japan, The Netherlands, New Zealand, Norway, Poland, Singapore, Spain, South Korea, Switzerland, Turkey, the UK and USA. 75 artists have contributed 47,500 bookmarks to the twelve projects to date. The artists' bookmarks are divided into 100 sets; one full set being sent to each of the contributing artists and the rest divided and sent in distribution boxes to participating host venues around the world, for visitors to take. Each bookmark is stamped with the current Bookmarks project website address, which directs the taker of the bookmark to the gallery section of the website. Visitors to the site can view works by the artists and contact contributors via their website and email links on our site. Annual Zine Fair as part of Manly Arts Festival 2015. Artist’s Book Treviso, Veneto Region) from 10th October - 2nd November 2015. 2pm – 5pm and 6pm - 8pm; Friday & Saturday 10am - 1pm. I love discovering new processes and challenges and am constantly looking for new ways to express myself. Book arts is a great way to do this. City breezes play is a small art book that I created by first printing on both sides of my paper in two colour ways blue gold/ turquoise. I then cut it up so that it would concertina and fold up into a little box, that was also printed on the lid.. There are 40 in the edition and are £40 each. Each box is signed and dated. This book is inspired by a poem by Amy Levy called The Plane trees. These trees are everywhere in London and actually under treat at the moment from a disease in Europe that could mean we would lose them all and that would be a tragedy for London. Claire Robinson is a print maker using screen printing techniques with mixed media to create her Limited edition prints and mono prints. combining many elements and processes including encaustic wax, Japanese tissue papers, collage, gold leaf, diamond dust, flocking to make her artworks unique.